Fourze Cosmic States 1st appearances is on Kamen Rider Fourze series. Fourze Cosmic States is kamen rider Fourze ultimate/final form using the cosmic switch. The power of the switch is to combine all the power of switches that fourze has previously. The main weapon is the rocket shape swords ("Cosmic Module Barizun Sword"). His finishing attack is "Rider Super Galaxy Finish". Hello, dejivruR™ is in da house, this is my first collaboration review with TenToyGallery™. 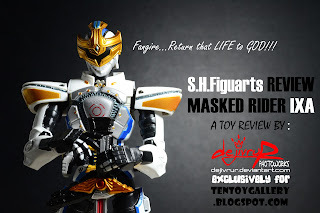 my first collaboration review with TenToyGallery™ is... the white knight... MASKED RIDER IXA. MASKED RIDER IXA is the secondary rider that appears in the 2008 kamen rider franchise, kamen rider kiva. and have the concept of "white knight", "Templar", or "crusader" with his tagline "return that life to GOD". Enough with that... SHFiguarts MASKED RIDER IXA is by far the best that has appeared in kamen rider Kiva SHF line-up since it is by far better than Kiva Emperor or Dark kiva in terms of pose ability and solidness. Gai 1st appearances is on "Kamen Rider Ryuki" series. Masked Rider / Kamen Rider Gai is a melee fighter who relies on brute strength and his intellect more often than anything else, his attack methods usually involve his Confine Vent card to cancel any weapons from the other Riders while using the Metal Visor on his left-shoulder to conjure his Metal Horn gauntlet as well as summoning his contract monster Metalgelas to fight alongside him and execute his Heavy Pressure Final Vent, carried by his Contact Monster as a lance, with the Metal Horn extended in front of him to pierce through the opponent (source). Meteor Storm 1st appearances is on Kamen Rider Fourze series. Meteor Storm Form is the power-ups form of Kamen Rider Meteor. It comes with a blue shiny metallic color with a clear gold color vest. Equipped with a shaft that can be mounted by his meteor storm switch to perform his limit break. Tiger 1st appearances is on "Kamen Rider Ryuki" series. Masked Rider Tiger is a close combat rider equipped with Dest Visor axe and Dest Claw. He depends on his contract monster (Destwilder) when fighting with other rider. His Final Vent is Crystal Break where Destwilder will drag the enemy in the floor, throw them up in the air and finish by Tiger. Akiba Yellow 1st appearances is on "Hikonin Sentai Akibaranger" series. Akiba Yellow as one of the "Hikonin Sentai Akibaranger" team member is an Otaku and a cosplayer. The design of the suit is very unique. 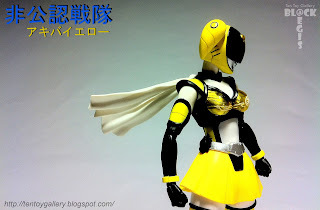 The helmet comes with 2 ponytails and equipped with scarf.